Love Carrot Cake? 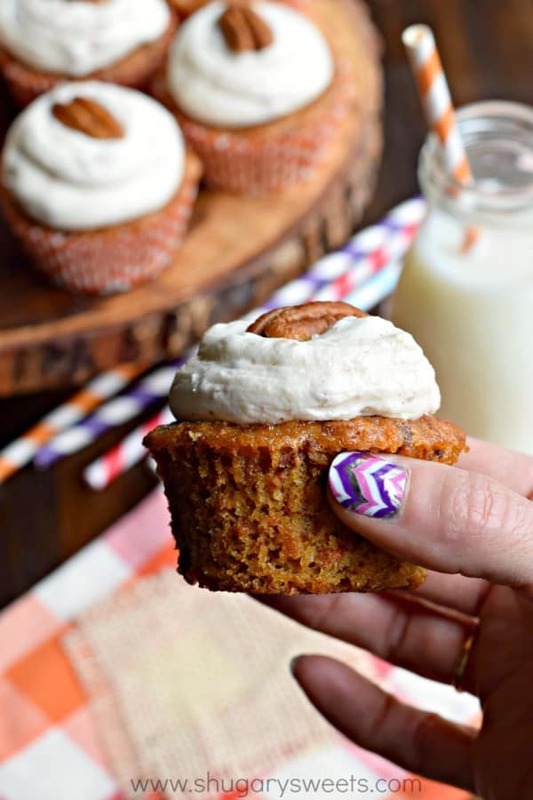 These delicious Carrot Cake Cupcakes have a delicious Cream Cheese Frosting! Perfect for a weekday dessert or weekend potluck! I don’t know how people work at Starbucks. Not the actual employees…although that would take so much self control for me to not drink #allthecoffee and eat #allthedessert. But I’m talking about actually sitting at a table and trying to get some work done. I’ve only had to do this a few times , when my internet has been down, or when I have work and I’m waiting to pick up a child from swim practice, etc. But I must say, I am so less productive. I find myself listening to the barista call out orders. Then I like to “see” who ordered what, so I spend a lot of time watching people. Earlier this week I went to Starbucks to meet a friend, and I arrived WAY early so I thought I would get some work done. But the baristas there were so entertaining, I didn’t accomplish anything. Except drink 3 coffee drinks and eat a slice of lemon bread. 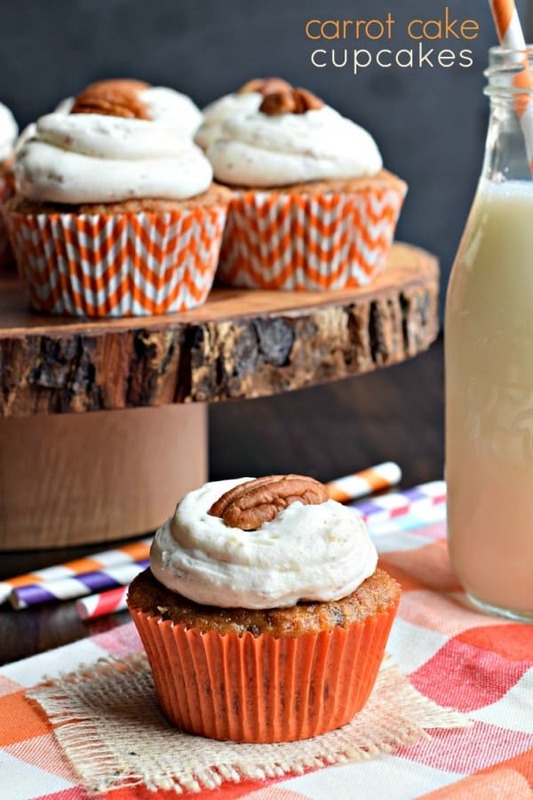 My plan had been to write about these Carrot Cake Cupcakes…but I kept drawing a blank. Or I found myself writing about coconut, lemon bread, venti, grande…as I listened to the employees I kept writing the words they were saying. Clearly I was distracted. Which is odd, because I work from home. TONS of distractions at home. I think I thrive off distractions at home. I’m a pretty productive person and can totally multitask my home chores with my blog work. I have a system at home. I can even have music or the TV on and it doesn’t distract me. It must have been the coffee. Ha! Anyway. 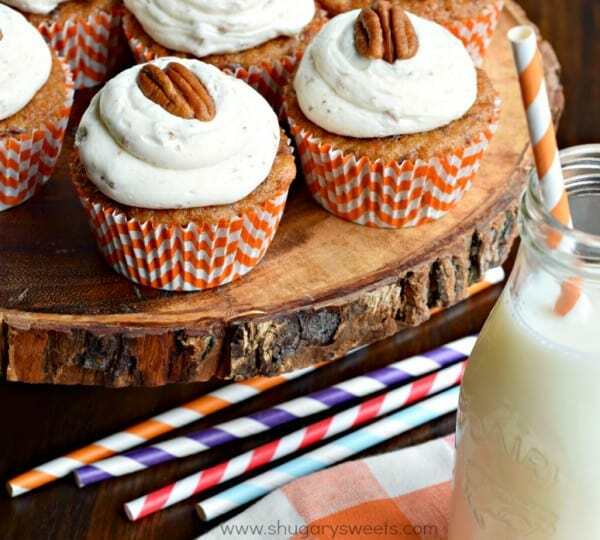 Carrot Cake Cupcakes. 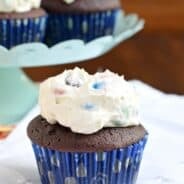 Sweet, moist cupcakes, from scratch. 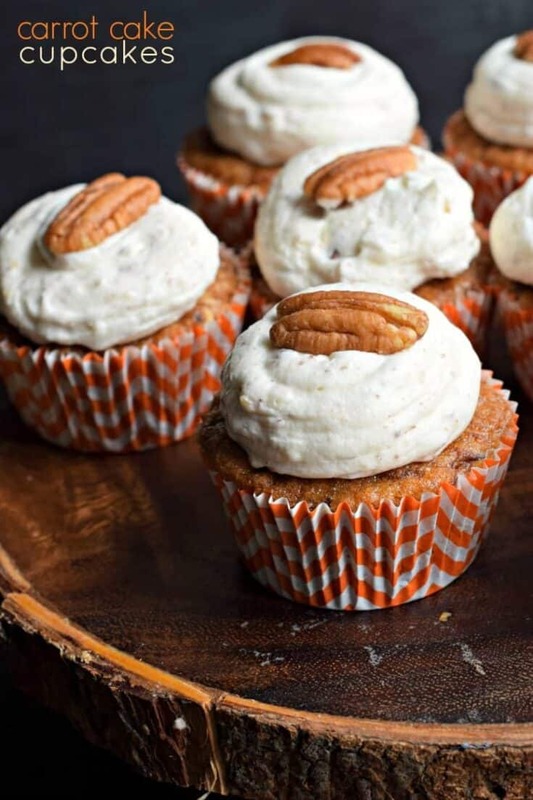 Topped with a delicious cream cheese frosting full of chopped pecans. This is what I want for Mother’s Day dessert. I can’t get enough of the Carrot Cake this season! You may remember this Carrot Bundt Cake from a few weeks back. I don’t know what it is, but I just LOVE the moisture carrots add to cupcake batter. Similar to zucchini, really!! ENJOY! Love cupcakes? Cool. Me too! 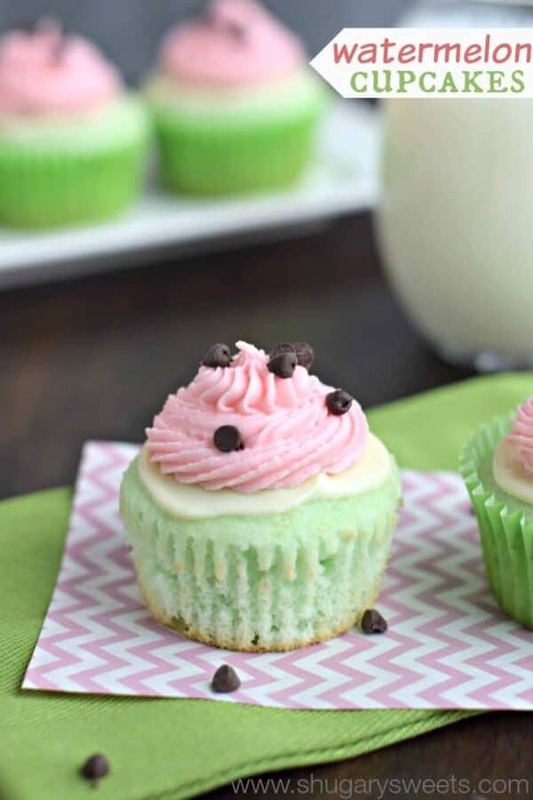 Watermelon Cupcakes: not only are they delicious, but they’re cute too! 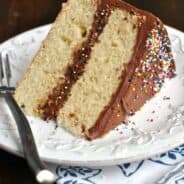 Perfect for summer or a bake sale! 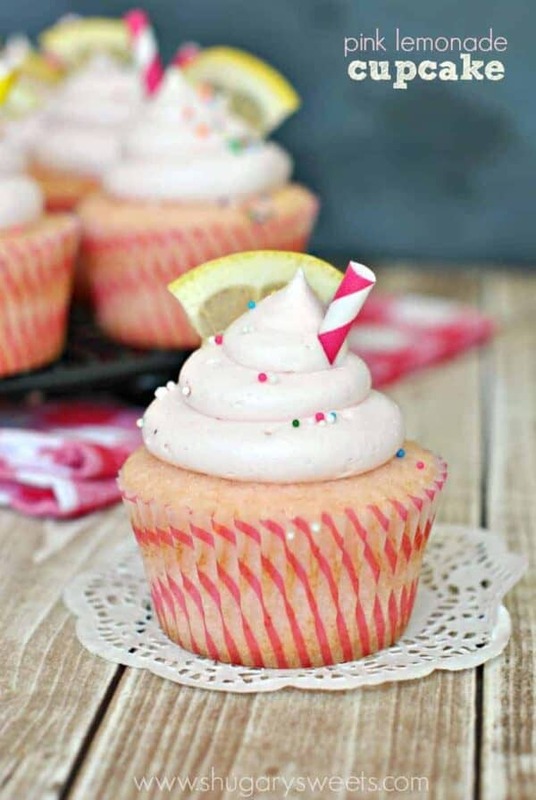 Pink Lemonade Cupcakes: if you’re going to make cupcakes, you must make them cute! 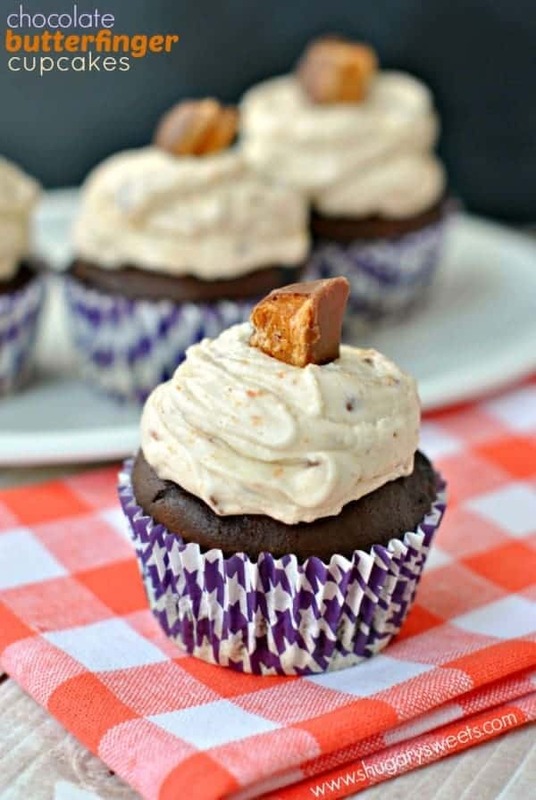 Chocolate Butterfinger Cupcakes: chocolate cupcakes with a creamy Butterfinger frosting. Doesn’t get much better than this! Preheat oven to 350 degree F. Line cupcake tin with paper liners. Set aside. In a mixing bowl, combine sugar, oil and eggs. Beat until well blended. Add in flour, baking soda, baking powder, and cinnamon. Beat for 2-3 minutes until fully combined. Fold in carrots. Fill cupcake tins 3/4 full. Bake for 18-22 minutes. Remove and cool completely before frosting. For the frosting, beat butter and cream cheese together for 3 minutes, scraping down sides as needed. Add in vanilla and powdered sugar. Beat 3-4 minutes until fluffy. Fold in chopped pecans. Use an open tip to pipe onto cupcakes. Top with a pecan halve if desired. ENJOY. Aimee, I’m totally distracted at Starbucks too! For this reason I carry a pkg. of foam earplugs with me at all times…and even then, I have bionic ears. Just nosy I guess. (Hey at least I’m not window peeping. )These are the cutest little carrot cupcakes EVER. And I know they taste fabulous. Might have to sneak one into Starbucks to have with my vanilla chai. Have a FABULOUS weekend! I need to know your tricks for staying focused at home. I am right now thinking about dishes and laundry and walking the puppy. Not good for productiviity that’s for sure. 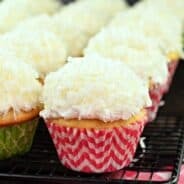 I love these cupcakes and the pic with your nails and matching straws! So fun! These look amazing, Aimee — carrot cake is one of my all time favorites. 🙂 And I love your new site design — it’s just beautiful! These cupcakes look absolutely perfect Aimee! And – your site! I love it! I am the same way! I always end up people watching! These cupcakes look perfect! I can not work with a bunch of distractions! I would be like you, just people watching the whole time! These cupcakes look delicious and I love your wood cupcake stand! So cute! Totally with you. Starbucks is for people watching, not working! These cupcakes are AMAZING. I love that giant dollop of frosting! Haha, I can’t imagine trying to work at Starbuck’s! It’s probably a good thing we don’t have one close by. 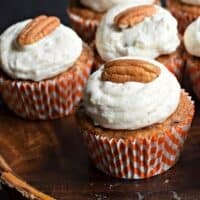 I love how moist carrot cake is — definitely have to try these! These look YUMMY! My daughter loves carrot cake! I’ll be making these for her birthday next week! I’d like to add some pecans or walnuts into the batter. How much could I add? Depends on how “nutty” you want the batter! I would suggest after making the batter, fold in about 1/2 cup chopped pecans or walnuts. Stir…eyeball it, and decide if you want more 🙂 ENJOY! Hello, I’m so happy I found you blog on internet. These delicious cupcakes (I love cupcakes) and that wonderful carrot cake cheesecake cake, I’ll be busy cooking this week-end lol. Thank you for having me , keep on cooking lol. Looks delicious and attractive, how can you have so many great ideas.